The Axillary Lymph Node Dissection web site is launched. Welcome to the Axillary Lymph Node Dissection website, created for the Princess Margaret Hospital Department of Surgical Oncology. 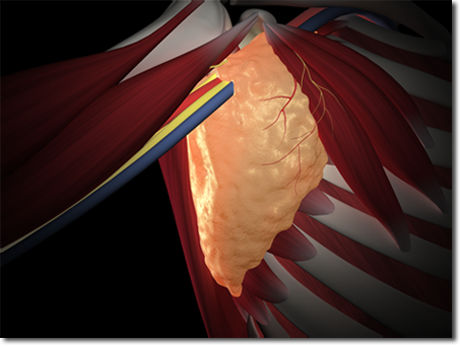 This 9 ½ minute animation provides an overview of the anatomical and surgical aspects of the axillary lymph node dissection (ALND) procedure. The animation is divided into six chapters, which can be accessed by clicking on the menu items to the left. This project was designed to augment surgical residents' understanding of the anatomy of the axilla, and the surgical approaches to isolate and excise the axillary fat and lymph nodes. Click on the image above to begin Chapter One: Axillary Anatomy.